Solid waste collection and disposal poses a serious developmental challenge to many governments in developing countries of which Ghana is no exception. In a concerted effort to tackle this challenge has necessitated the involvement of the private sector to partner with governments. It is imperative to state that the involvement of the private sector has not seen any drastic improvements in the management of solid wastes. An assessment of Zoomlion Company, a private solid waste management company in the Sunyani Municipality in the Brong Ahafo Region of Ghana has amply testified to this phenomenon. This study was conducted with a sample size of 76, consisting of 40 residents from non-residential areas, 30 from residential areas and 6 officials selected from both the Municipal Assembly and Zoomlion Company. A mixed method research design involving questionnaire, interview and observation was used in the data collection. The research revealed that sole-sourcing does not promote effectiveness and efficiency in any developmental agenda such as solid waste management. This is due to the fact that the selection of the Zoomlion Company was not done through any rigorous competitive bidding. 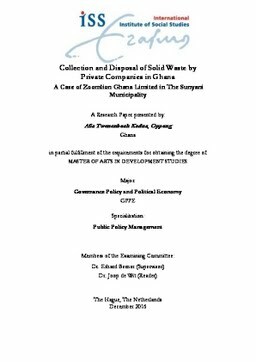 It was revealed that the collection and disposal practices in the Sunyani Municipality was far from being appropriate due to certain inappropriate collection and disposal practices such as insufficient human and materials resources, people’s attitude towards sanitation practices and the sanitation workers, and lack of knowledge or education on waste management as a whole. In a bid to ensure practical improvement in solid waste management in solid waste management in the Sunyani municipality, the study has recommended that the Assembly should award contracts with due recourse to the Public Procurement Act (Act 914) of 2016. Finally, the Assembly should, among other measures expedite actions on intensifying regular supervision and periodic public education on solid waste management in order to ensure effectiveness and efficiency for a better health for the residents.